Moving can generally be a stressful time in one’s life. Even simply moving down the street requires you to take a ton of thought and effort, but if you’re moving across the country, there are other factors you need to consider. Unfortunately, there are scams that you should be aware of prior to your moving. Otherwise companies can act fraudulently and cause you grief in an already stressful time. Moving companies can be notorious for scamming unsuspecting movers. When transporting your stuff across the country you will want to make sure the company that helps you move is reputable and trustworthy. Millions of people are moving every year and while most of the people who move don’t experience any scams, over the last few years there has been an increase with moving company scams. The best way to avoid these types of scams is by doing your research and making sure you are well informed about any company you are looking to do business with. Moving companies are meant to help make the process go a bit more smoothly, but it does not mean you should blindly allow someone to help you. While every moving company may be different there are definitely some common trends among scammers that you will want to be careful about. If you call a company and they try to give you an estimate without first completing a walk-through, it may be something to be suspicious of. Most companies need to see the stuff being moved so they can estimate the weight and the bulk of the items needing to be transported. When moving, the prices are based on distance being moved, weight of the items, and how much space they take up in the truck. If the estimator is not looking at the items, they won’t be able to give you an accurate estimate. If the moving company asks you to provide any form of deposit. Reputable moving companies usually require you to pay after your items are delivered. If the company is asking you for a deposit or they want you to pay in full prior to the move, you should be suspicious of them and do more research on the company. 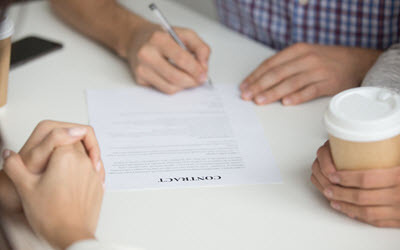 It is important to make sure you sign a contract prior to doing any business with a company, otherwise there is no legally binding documents to support you. If it is not in writing, it is not wise for you to do. It is for your protection that you have a contract. Make sure you carefully read through the contract before you sign. It should be a bit of a red flag if the company you are looking to do business with does business under other names. This is usually an indication of shady practices because most companies that frequently change names do it as a way to avoid being detected by the Better Business Bureau. Make sure you thoroughly vet the company before agreeing to work with them. If they answer their phone but don’t answer with their name, it could be a sign that they change their name frequently. Look for reviews of the company to get more information about their work and the services they’ve provided other companies. It is always good to ask your friends and family for recommendations on moving companies they may know of. It also might be good to ask a realtor if they may have any recommendations. As long as you do your research and know what to avoid, you should be fine. Watford Moving & Storage is a company that has been recognized for providing their customers with excellent customer service and for being extremely reliable. Our location is most convenient to residents of Santa Clarita and other Los Angeles County areas. We know the stressors involved with moving and want to help make that transition as easy for you as possible. If you would like to look more into our services we offer, or would like to contact us to receive an estimate, please visit our website, or call our office where a representative will be able to assist you.